Old man winter seems to be in for the long haul. Between extreme cold fronts and snow and ice storms I think it’s safe to say we can’t wait for spring to arrive. Right now in Atlanta it’s actually pretty nice, for now at least, that will all change in a couple of weeks when our next cold front rolls through. The one thing I do love about winter is that it’s soup season. 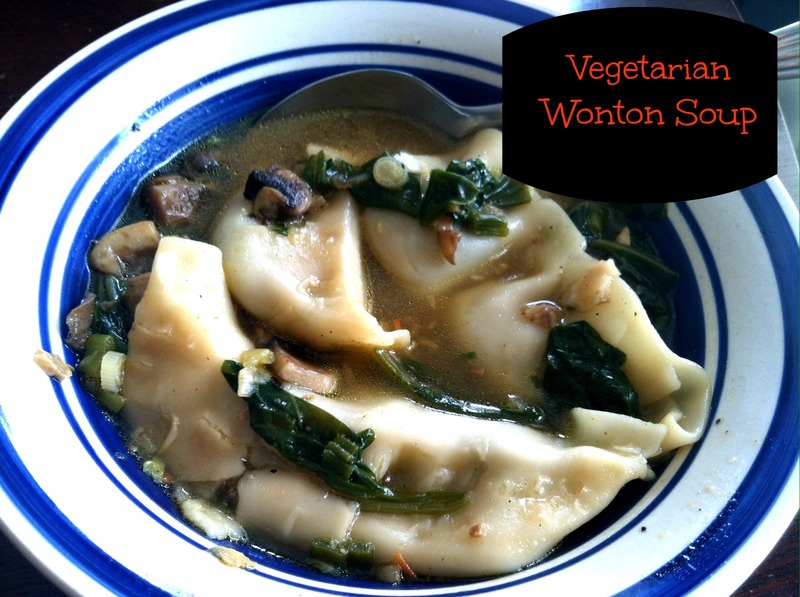 A few months back my husband brought home wonton soup (with meat in it of course). So I thought to myself, I do have some veggie wontons from the Asian supermarket in the freezer, why not make a meatless one. Luckily enough I had all of the ingredients in my fridge and cupboards. It came out very tasty and I even had enough leftovers for lunch the next day—even better! Steam wontons according to directions on package less 3 minutes. In a saucepan sauté mushrooms, chopped scallions and baby spinach in a little olive oil. Slowly add vegetable broth vegetables and add sea salt and pepper to your liking. Allow soup to simmer on low for at least 20 minutes. Then add the steamed wontons to the soup and allow to simmer for 3-5 minutes.